Like all good travel sites, at Best Car Hire we compare car hire Belfast City Airport prices to find you a cheap car rental Belfast airport in Northern Ireland and ensure that you avoid over-the-top fees to find an affordable car at the best price. You then save up your money to spend on other holiday treats and hit the road to explore your holiday destination or attend your important business meeting in Ireland as soon as possible! Choose from a selection of the best Belfast City Airport car rental deals including people carrier or minivan, MPV (Multi Purpose Vehicle), SUV (Sports Utility Vehicle), economy, executive, saloon, hatchback or luxury car rental Heathrow vehicles. Which Companies will Supply my Car Rentals Belfast ? When looking for the Best Car Hire Belfast City Airport we can help. Using the car rental booking engine search box above, you can pre-book online directly with the best international car rental companies at Belfast City Airport including :- Avis, Easirent, Enterprise, Europcar, Firefly, Hertz , Keddy by Europcar, Green Motion, Alamo and Budget. Where is Belfast City Airport ? Belfast City Airport is approximately a 10 minute drive into the city of Belfast in Northern Ireland. It is a 3 mile drive along the A2 road, connecting to the M2, M3 and M1 Motorway. Belfast City Airport was originally known as Belfast Harbour Airport. 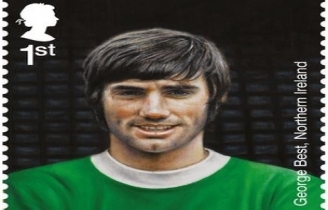 It changed its name to George Best Belfast City Airport in 2006 to recognise the importance of Belfast local hero and football legend, George Best. A People Carrier is the best economical choice of vehicles for all those occasions where you need to transport the family around or for multiple groups of people such as weddings, anniversaries, children’s parties, hen parties, stag parties, yoga holidays or sporting events. If you are arriving at Belfast City Airport and your group of friends want to hire a people carrier or a minivan to travel to your luxury holiday villa, or to have a fun golf holiday somewhere in Northern Ireland, we recommend that you book the best MPV at least two months in advance. As such, you will find that rental vehicle availability at Belfast City Airport will be easier and you will get cheaper people carrier rental rates. The summer time, Christmas and Easter holidays are our busiest times for people-carrier or MPV hire at Belfast City Airport bookings, so the best rental option is to pre-book online and plan your holiday car hire or business car rental accordingly. With flexible seating arrangements (backseats can be easily removed to provide more luggage storage) and all-round visibility (most have a sunroof), all our people carriers or minivans come with refreshing air conditioning (AC), so you will remain cool and comfortable even with a lot of passengers in the people carrier. We find that holidaymakers benefit from a mini-van or people-carrier hire Belfast City Airport especially when they need a larger vehicle rental. Prices for the 7-seater Ford Galaxy minivan of just 42 pounds per day are also fully inclusive of all your insurance needs such as CDW (Collision Damage Waiver) and liability cover. Additional facilities (at an extra cost) include GPS Satellite Navigational System, infant child seat, child toddler seat and booster seats. People carriers and multi-purpose vehicles are extremely popular because of their versatility and reliability and they make the perfect vehicle for any holiday outing. Book now for great prices on your Northern Ireland people carrier or car hire at Belfast City Airport. As part of the Belfast City Airport car rental deals we can present a choice of 5 seater, 7 seater or 9 seat minivan or people carriers including :- Ford Grand C-Max, Citroen C4 Picasso, Ford Tourneo, Opel Zafira, Volkswagen Touran, Ford Galaxy, Ford Transit or the Volkswagen Sharan. Most people who rent an SUV, benefit from its ability to carry more people than your average car, more cost-effective fuel consumption, safer due to their more robust chassis, more comfortable driving off-road on rough terrain due to their extremely efficient suspension and additional hill climbing control due to front-wheel or four-wheel drive (4WD) - handy for the many country roads in and around Northern Ireland. You can choose from the following SUV rentals Belfast City Airport : - Kia Sportage, Volvo XC60 or the Toyota Rav4. Just remember that with any car hire deals, the suggested Cheap Car Hire Belfast City Airport may not be the best value for money, so please take this into account when you consider any car rental discounts being offered for what seems like the right car. What Documentation Do I Require for my Car Rental at Belfast Airport ? To help you rent a car in Belfast City Airport, we have prepared a car hire travel checklist to help you with your reservation, but plan properly and avoid a headache. You will require a valid credit card, a valid photo ID (passport or national ID), driver's licence valid for 2 years and a printed version of the car rental voucher. If you do not present any of the documents mentioned, the documentation is not valid or you do not have enough funds on your credit card, the car rental agent may refuse to release the vehicle and no funds will be reimbursed to you. Where Can I Go in Belfast? Over the past twenty years Belfast has re-invented itself and is now a thriving commercial city during the day with a bustling night time array of pubs, clubs and fine dining restaurants. When you make your mind up to visit Northern Ireland, you will need to visit the Titanic Exhibition in Belfast. Jump in your hire car and drive up the coast visiting such wonders as the Giant's Causeway and Carrickareid Rope Bridge. Travel further afield and you can take your people-carrier down the M1 motorway from Belfast to Dublin in Eire. Travel time is approximately 1.75 hours. 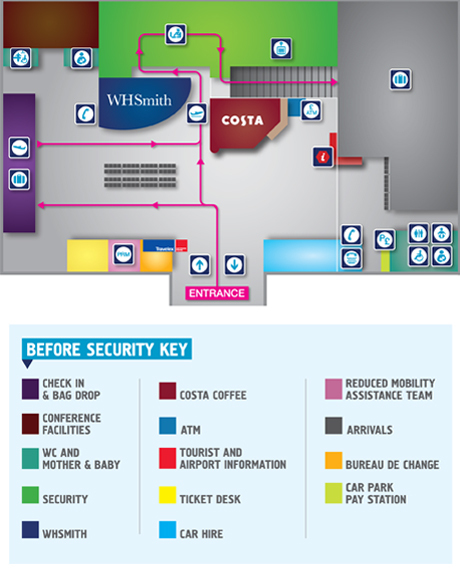 There is a 'food village' in the departures area with a number of cafés, snack bars and full-service options. In addition, there is a café on the ground floor in the public area. George Best Belfast City Airport is not known for shopping, but it has a small selection of newsagents and gift shops, including a duty-free outlet. The short-term car park at George Best Belfast City Airport is close to the terminal, while the long-stay car park is further away and is accessed by a courtesy shuttle service operating at 15 minute intervals. Additional services include convenient fast-track parking and executive parking – both of which are next to the terminal.